WASHINGTON - Alex Pyron’s expertise is in family trees. Who is related to whom, who begat whom, how did they get where they are now. But not for humans: reptiles. In 2011, his fieldwork in Sri Lanka studying snake diversity on the island led him to confirm the identity of 60 known species of snakes. With Sri Lankan collaborators, Ruchira Somaweera, an author on snakes and expert on amphibians and reptiles, and Dushantha Kandambi, a local naturalist and snake expert, the team collected the snakes and of those, Dr. Pyron used DNA sequencing technology on 40 of them. The study led to a greater understanding of how all the snakes are related to each other and their evolutionary relationship other species globally. “We found that Sri Lanka has been colonized by snakes at least five times by totally different snake groups, which have each diversified heavily within the island,” said Dr. Pyron, the Robert Griggs Assistant Professor of Biology at George Washington University in the Columbian College of Arts and Sciences. Dr. Pyron’s findings were recently featured in the March edition of the journal Molecular Phylogenetics and Evolution. One finding was a blindsnake, which on its own would be noteworthy but in this case, the blindsnake had a history on the island. “Molecular data, or DNA, has revolutionized all fields, whether finding genes for cancer or detecting new species. In my field, uses of DNA are twofold: to discover if populations are really new species and two, to determine how species are related. We were able to do both of these things in Sri Lanka. We discovered the blindsnake and we suspected it was a new species, but when we sequenced it, we discovered that it was an entirely new lineage of blindsnake. It's still a blindsnake, but a new genus, a group of blindsnakes that had never been discovered or described. Using datasets that included equal number of genes from endemic, or native snakes, and those that have colonized their fellow snake community, he and his team were able to determine how the 40 sequenced snakes were related to each other, a discovery that also revealed the deep biodiversity present on in Sri Lanka. “We use complex chemical reactions to fragment the cell and the genome, and collect the purified DNA. It then gets passed through an even more complex series of reactions that allow us to determine the sequence of a large fraction of the genome,” he said. Dr. Pyron was recently awarded almost $16,000 by the National Geographic Society to do a similar study of lizards, also in Sri Lanka. 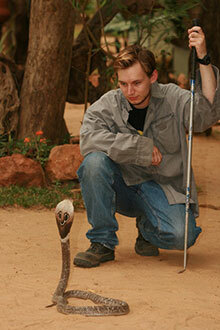 His research reveals that for all that is known, there is still so much that is unknown about reptiles. “Sri Lanka has one of the oldest recorded civilizations on the planet, and the blindsnake was discovered in the yard of an environmental agency office. Species are still being discovered there, and even the ones that were known were not really ‘known,’ as the DNA data are telling us new stories about how they are related, completely contradicting what we thought we knew. It tells us that Sri Lanka is a much bigger hotspot for biodiversity than previously known, and harbors massive richness. Established in 1821 in the heart of the nation’s capital, The George Washington University Columbian College of Arts and Sciences is the largest of GW’s academic units. It encompasses the School of Media and Public Affairs, the Trachtenberg School of Public Policy and Public Administration and more than 40 departments and programs for undergraduate, graduate and professional studies. The Columbian College provides the foundation for GW’s commitment to the liberal arts and a broad education for all students. An internationally recognized faculty and active partnerships with prestigious research institutions place Columbian College at the forefront in advancing policy, enhancing culture and transforming lives through research and discovery.